» Is XM Weather Coming to the iPad? Is XM Weather Coming to the iPad? While the iPad is proving to be a very popular and useful tool for aviators – both on the ground and in the air – I think a great many of us would like to be able to see real time XM weather on it while airborn. The day when that is possible may be near. Airguide Publications, who offers the Flight Guide iEFB for iPad, is taking pre-orders for an external GPS receiver that connects to the iPad by WI-FI. 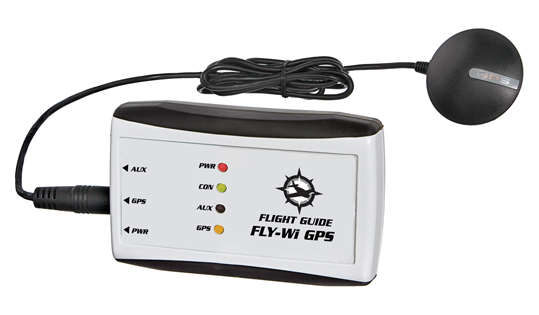 The Fly-Wi GPS includes the WAAS GPS receiver and a wireless transmitter that creates a WI-FI hot spot in the cockpit. As an added bonus the Flight Guide FLY-Wi GPS includes an auxiliary jack that, with future updates to Flight Guide iEFB, will give pilots an in-flight weather option for integrating XM or ADS-B to display on Flight Guide iEFB seamless charts! I hope we see that update soon and I also hope that this is just the start of a bunch of new hardware devices to expand the iPad’s cockpit utility. Other external GSPs are already available like the Bad Elf and the GNS 5870 MFI Bluetooth GPS Receiver, both supported by ForeFlight Mobile HD. Now it looks like interfaces to weather and traffic hardware might be coming too. It is about time. Why is weather works sticking with Windows platforms? Geez. SkyRadar has a GPS/ADS-B receiver that we use in our aircraft and it works well, giving us in-flight radar and weather reports for many airports. This works with WingX and does so quite well. We are still evaluating it full extent but at present the limited range, at altitude (the flight levels) seems to be 2 to 3 hundred miles in all directions. We will be looking at its coverage out west soon but for now, it works well. Baron Mobile Link already provides a wireless interface between XM weather and iPads. Works with Foreflight, Garmin Pilot (iOS and Android),and GlobalNavSource. I have used it for XM in flight and it works. To my knowledge Foreflight only supports Mobil Link for XM weather. It looks from the pre-release ver 5.0 info that FlightGuide will support four weather boxes but not the MobilLink? I have always liked FightGuide books for airport info and it is my hope they will support the Mobile Link product so that I can use one piece of gear across all software applications that I might use. Since I already have a Baron Mobile Link there is not a chance I will buy another box just for FlightGuide iEFB.